William Ball was born in Horsehay, Great Dawley, a local, colourful character with the nickname ‘The Shropshire Giant’ because of his size. He was a little over five feet nine inches tall and weighed more than forty stones. It was said that his ‘waistcoat was so big that three men could be buttoned into it’. He married twice in his life: firstly, to Mary Bailey in 1819 who had two children, Eliza in 1823 and Thomas in 1824, though sadly both daughter and wife died in 1824. Thomas died at a young age also, when he was only fifteen. William Ball was more fortunate in his second marriage to Margaret Wood, though there were no children. Despite the sadness of his personal family matters, and his great size, William Ball was known as a jocular man with a very pleasant disposition. From the age of eight he was employed first as a puddler and later as a shingler in the Coalbrookdale Company’s Horsehay Ironworks, where he continued for forty years. Puddling was a skilled and perilous job that demanded great muscular strength, and William Ball was immensely strong, on one occasion reputedly lifting a piece of iron weighing nearly nine hundred weight to place under the forge hammer. He only ceased working because a piece of molten iron blinded him in one eye. 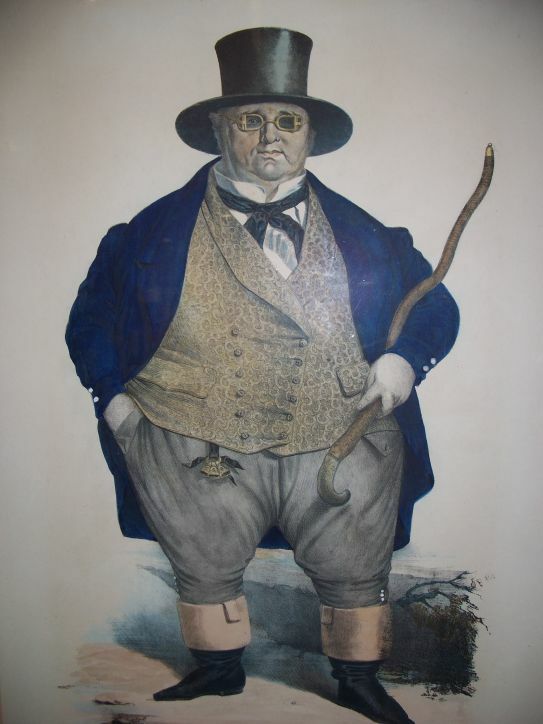 When he left the Ironworks he exhibited himself round the county fairs as the largest man in Britain, appearing under the pseudonym ‘John Bull’. He acquired national prominence as a celebrity guest/exhibit at the Great Exhibition in London of 1851, travelling to London by train in the guard’s carriage, because there was no seat big enough for him. This was his last major public appearance. On his death, he was taken from his home in Horsehay in Sandy Bank Row, since demolished. Even with the assistance of poles and straps, it required ten of the strongest men in the district to carry the coffin, which was also said to be so large that ‘ten lads were able to lie in it’. William Ball was finally laid to rest in an unmarked grave at St Luke’s Church in Doseley. • Born in Horsehay, Dawley. Had the nickname ‘The Shropshire Giant’ because of his size. He was a little over five feet nine inches tall and weighed more than forty stones. • From the age of 8, he was employed for forty years at the Coalbrookdale Company’s Horsehay Ironworks. He only ceased working when a piece of molten iron blinded him in one eye. • He exhibited himself round the county fairs and at The Great Exhibition in 1851 as the largest man in Britain, appearing under the pseudonym ‘John Bull’. • William Ball was laid to rest in an unmarked grave at St Luke’s Church in Doseley.